(Photo: © Peter Kenny / Ecumenical News)World Council of Churches communications director Marianne Ejdersten (L) and Beatrice Fihn, executive director of ICAN (International Campaign to Abolish Nuclear Weapons) during a media conference at the Ecumenical Center in Geneva after it was announced ICAN had won tbe 2017 Nobel Peace Prize. The International Campaign to Abolish Nuclear Weapons says it will work tirelessly in coming years to ensure the full implementation of the nuclear ban treaty it assembled, despite a lack of support from nuclear powers. 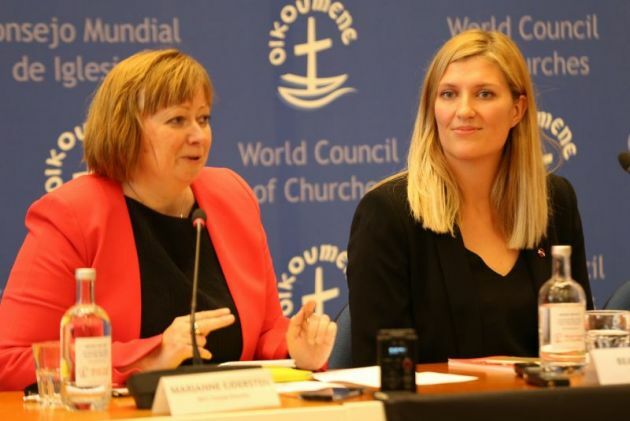 Beatrice Fihn, executive director of ICAN, said at an Oct. 6 media conference at the headquarters of the World Council of Churches in Geneva, "It is a great honor to have been awarded the Nobel Peace Prize for 2017 in recognition of our role in achieving the Treaty on the Prohibition of Nuclear Weapons." Opening the conference, WCC general secretary Rev. Dr Olav Fyske Tveit said, "It is a very important day for moral standards in the word. It should be obvious that there should be no nuclear weapons...As people of faith we must say this together." The WCC general secretary is a Norwegian Lutheran and he said, "I look forward to the day when my government will sign the treaty." 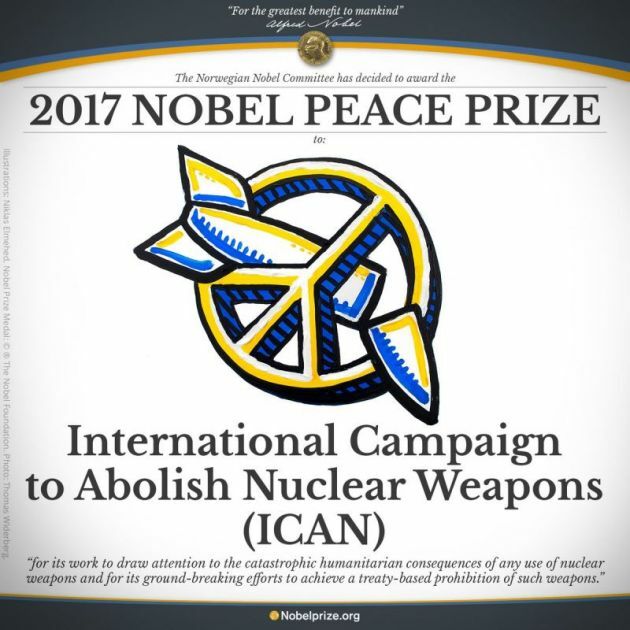 The Norwegian Nobel Committee had earlier honoured the Geneva-based group "for its work to draw attention to the catastrophic humanitarian consequences of any use of nuclear weapons and for its ground-breaking efforts to achieve a treaty-based prohibition of such weapons." Fihn said that the agreement, was adopted 7 July with the backing of 122 nations at the United Nations General Assembly in New York. ICAN has existed for 10 years and is a coalition of 400 non-governmental organizations in 100 countries having different church and faith groups in it. The WCC is one of its partners along with many civil society organizations. The ICAN headquarters in Geneva has a staff of four people. Fihn spoke of the victims of the only two nuclear bombings the world has experienced in 1945 in Japan noting that the prize is a tribute to them. "It is a tribute also to the survivors of the atomic bombings of Hiroshima and Nagasaki – the hibakusha – and victims of nuclear test explosions around the world, whose searing testimonies and unstinting advocacy were instrumental in securing this landmark agreement," said Fihn. She noted, "The treaty categorically outlaws the worst weapons of mass destruction and establishes a clear pathway to their total elimination. It is a response to the ever-deepening concern of the international community that any use of nuclear weapons would inflict catastrophic, widespread and long-lasting harm on people and our planet." None of the five permanent members of the Security Council, however, signed the treaty nor did any states known to have nuclear weapons or any member of the North Atlantic Treaty Organization (NATO). Asked by a journalist if the lack of a signature from any of the five permanent Security Council members and other nuclear states was divisive for the world, Fihn replied, "It is the nuclear powers that are dividing the world." She said that the, "majority of the world does not have nuclear weapons and nuclear weapons do not bring peace and stability" while noting that people on the Korean Peninsula and Japan "do not feel particularly safe." Fihn said, "The treaty offers a powerful, much-needed alternative to a world in which threats of mass destruction are allowed to prevail and, indeed, are escalating." The Nobel committee statement, read by committee chairwoman Berit Reiss-Andersen, was also ready at the Friday media conference, read by the WCC general secretary. Tveit read: "through its inspiring and innovative support for the U.N. negotiations on a treaty banning nuclear weapons, ICAN has played a major part in bringing about what in our day and age is equivalent to an international peace congress." The aim of the treaty to delegitimize nuclear weapons and to make them illegal, said Fihn. "We hope that this treaty will provide space for those states that have not signed this treaty," said Fihn, noting that the treaty will enter into existence when 50 states have signed it. "We will use the treaty to put pressure on states that have said they will never sign it...It does change things when the rest of the international community declares them illegal...It will take time, but we will get there."